When you say that Paris or London are some of the interesting capital cities to visit in Europe, the capital city of Germany is also comparable to these cities. Since I already visited this city, I can say that Berlin is also one of the most beautiful and stunning cities to visit in Europe. Brandenburger Tor (Branderburg Gate) , the famous landmark of Berlin. I was there! Just a bit overview of this city. Berlin is the capital and largest city of Germany. It is also one of the sixteen states (Länder) of the Federal Republic of Germany. Berlin has played one of the most important part of German history. It is also an international city, also called as global city. It can compete with other European cities like Paris in France and London, England. I was simply amazed of what I saw and experienced in Berlin lately. I believed of what my friend from Berlin told me that seeing everything in Berlin will take sometime, probably a month. I believed him because it is truly a big city. Berlin has a lot to offer to its guests and visitors. Here are some of the things you can do when visiting Germany's known capital. 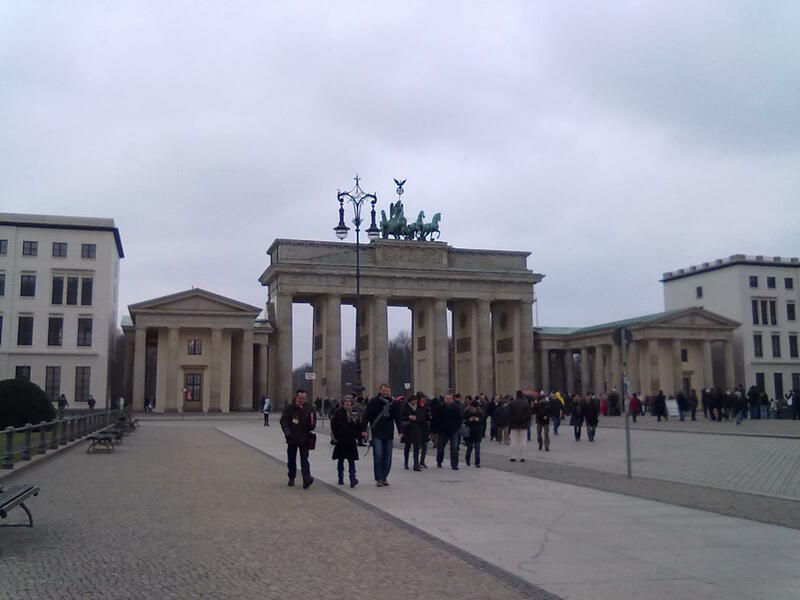 Don't miss to see the iconic symbol of Berlin and Germany, the Brandenburg Gate. The Gendarmenmarkt with French and German cathedrals, the Berlin Cathedral,Berlin Wall, Potsdamer Platz, Checkpoint Charlie, Alexanderplatz, the Reichstag or Parliament building are only some of the sights to see in Berlin. There are still a lot of things to explore in this city. If you want to experience having like a tropical vacation near Berlin, you can also visit the Tropical Islands Resort. It is located in Briesen/Brand, part of Halbe in Dahme-Spreewald, Brandenburg, Germany, about 60 km south-southeast of Berlin. This is also the reason why I still want to go back to Berlin in the near future, to experience tropics during winter season. Berlin is famous for its lively nightlife, for its many cafes, clubs and bars. It is an honour for me to spend a night with friends in one of the famous cafes in this city. I wanted to experience a live jazz either in B-flat or Quasimodo but I don't have much time for it. What is two nights in Berlin anyway when you are already exhausted after each day of sightseeing. If you love to socialize with people in Berlin, there are plenty of bars and clubs to go in this city. I even read that they have a magazine there that has a list of the famous cafes, bars clubs. I guess I need to get one in my next visit. This is one of things that I should avoid when I visited Berlin last month. I thought I only go there for sightseeing but I ended up shopping in one of its famous shopping mall, the Kadewe. I love shopping and I can't deny that. I was really tempted when I go around inside the Kadewe mall. Whether you want to go for designers items like Gucci, Prada, Louis Vuitton, Dior,Chanel, Bulgari, Cartier, Montblanc and other famous names, this store has everything. Kedewe Mall, it stands for Kaufshaus des Westens which means in English Department Store of the West..taken during my visit last February 2011. Other famous stores to visit in Berlin are Galeries Lafayettes, Galeria Kaufhof and Peek & Cloppenburg. There are also affordable and fashionable shopping in Prenzlauer Berg, Kreuzberg and Friedrichshain with a lot of young designers opening shops, but also lots of record stores and design shops. I am already happy and contented of my D&G bag and my DKNY leather boots from Kadewe. There around a hundred of cinemas in Berlin. It has a lot of opera houses like the Komische Oper, Deutsche Oper, Neuköllner Oper and Staatsoper Unter den Linden.Some of the famous theatres are the Friedrichstadtpalast, Deutsches Theater, Schaubühne am Lehniner Platz, Theater am Kurfürstendamm and the concert houses include the Berlin Philharmonic orchestra is one of the best in the world and the Konzerthaus at Gendarmenmarkt. Berlin is rich and famous for its many historical and modern museums. A day ticket to go inside a museum usually cost from 6-8 Euros. The Museumsinsel or Museum Island, the German historical museum, Jewish Museum, Museum of European Cultures, Topography of Terror are only some of the museums in Berlin that are worthy to visit. Be sure to include Berlin in your must-see cities in Europe.